Don't think we have given up! We feel very proud to have been greenlit on Steam and we are being very well received. For all Crow's Eye followers out there, we are still alive on Steam and on social networks like facebook or twitter, where we'll continue to inform you. Many thanks to each and every one of you for the amazing support we're having! We're focusing much more on playability, the story and the emotions than on graphics and easily scaring people. We want puzzles to be a real challenge for the player, which require exploring, observation, and the ability to solve problems, including a crafting system that rewards the player who investigates each corner of the game. The game is being developed for PC, supporting Windows, Mac and Linux, and we are studying the possibility to release it for other platforms. The game will be DRM-free, and it is available on Steam Greenlight in order to access Steam (you will receive a key once the game is released). We will also try our best so that it becomes available in other digital stores such as Desura, GOG, or Humble Store. -Bioshock: The art in Bioshock is something we love, and we have wanted to add this kind of elements both in the surroundings and the game interfaces. Additionally, narrating events through recordings is something we have wanted to use to give it this 'old' touch. -Amnesia: Being able to interact with our surroundings is one of the aspects that make Amnesia something interesting, and we have wanted to bring it a little farther. Enemies are desperating, since you have no weapons to kill them and you have to escape from them. Despite our choice, we want the player to confront them with items found in their surroundings, or crafted ones, with no possibility to mortally hurt them. We will have to advance through the university collecting documents, recordings, crafting, solving puzzles, and avoiding monstrosities. Crafting items: Collect the different receipts to discover how to ellaborate items parting from others you will find through the levels. Some will be more hidden than others, so search well through the many rooms, ventilation ducts, furniture, etc. Items will have different uses. While some will be used to advance through the game, others will drive enemies away, or will grant improvements to the player. Interact with your surroundings: You can use the vast majority of items that surround you in many ways, as would be throwing them against enemies, reaching high areas, and opening doors or drawers. In some puzzles or situations you will need this kind of elements, otherwise it will be difficult or close to impossible to advance in the game. Explore: Freely investigate the map in search of documents, crafting items or secrets hidden throughout the game. Exploration will always rewarded for those tempted to search in hidden places. 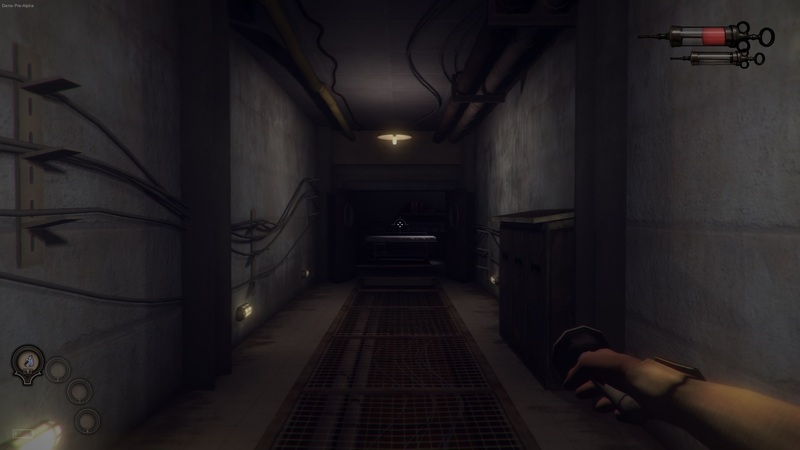 First-person immersion: Put yourself in the skin of the character and advance through the abandoned Crowswood University, its installations and surroundings. The melodies altogether with the sounds will make it a chilling experience. - Main puzzles: They are part of the main plot and are compulsory in order to reach the following levels. There is a vast range of them through the game. - Secondary puzzles: They do not follow the main plot and unlock secret areas. There are a few of them spread through the levels, and their difficulty is quite high. Some puzzles are not what they look like. Observe the enemy: Advance stealhily and beware the enemies' moves. Search their weaknesses in order to confront them, use crafted items or those in your surroundings to stun them. There is a broad range of enemies in the different levels, each worse than the other, so make sure you are ready before advancing, or you will last little to no time alive. We are doing our best in order to achieve a highly dynamic playability in which your actions are well-reflected in-game. We want the player to be free to explore and interact with their surroundings in order to see every detail within each level. The player will be able to craft items parting from others he will collect through the different levels. He will also have the chance to use them in many different ways. There will be times in which he will have to craft an item and use it to advance in the story. There will be documents and recordings to understand the story hidden behind the university, as well as the main character’s role in it. You will have to complete puzzles in order to continue advancing. Some of them will have added difficulties such as a timer or dangers which will keep the player’s full attention. Each enemy will have its weaknesses. The player will have to learn the behavioral pattern, and, once discovered, decide which strategy to use in order to survive. 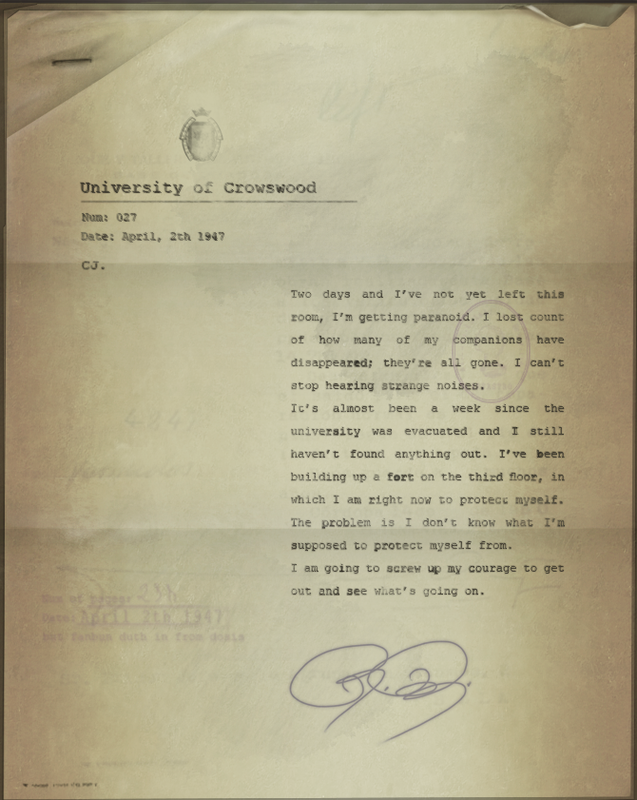 Four students disappeared in Crowswood University, causing a great impact in the press. In an attempt to calm the masses, the director of the university, William Holtwick, called detective Benjamin Bennet altogether with other police members in order to solve this delicate matter. The university was cleared and only the agents, along with some professors, stayed to solve this mystery. However, as days passed they began to disappear until only two of them remained: detective Benjamin Bennet and police officer Robert Kansas. Both united to dismantle the mystery of the disappearances and the monstrosities lurking around the university, like hunters approaching their preys. Not many days after, they disappeared leaving no trace, and the authorities closed the university down forever, not knowing what really happened in that place. You awaken trapped in the room of an abandoned building, Crowswood University. A place where years have not passed ever since it was closed. And that is where your story begins: the journey to a nightmare. The story is divided between events involving characters who left recordings throughout the university. As we obtain said recordings, we will find out what happened and what lies behind the mystery they narrate. The game plot will be marked by three temporary phases. Bearing in mind that the present in-game time is the 1960s, the recordings were made back in the 1940s, and the precedents are from a century back, when the recordings were made. 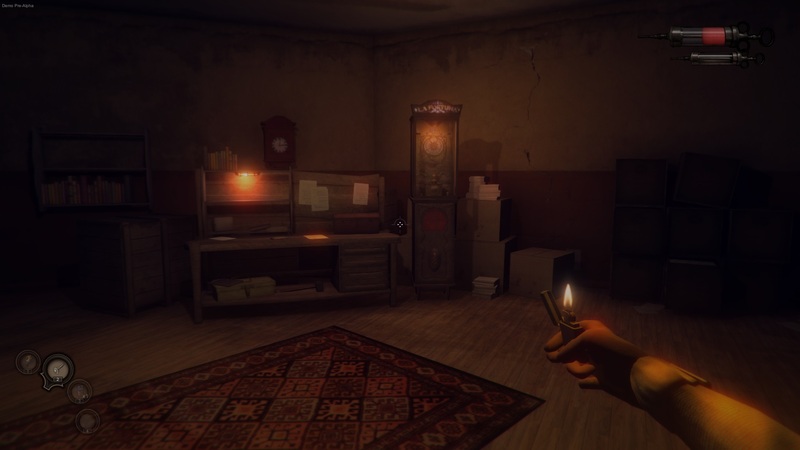 A story full of enigmas that will make you want to get to the bottom, and find out how the main character fits in this puzzle..
Robert Morancho has designed the surroundings, caring for each detail to make the player enjoy inspecting each corner of each room. During your way through the game, you will observe how, as you advance, everything appears increasingly wreched and dirty, but in spite of that you will sense there is still life in that place. A room with a crafting table and the saving device. A corridor full of cables and pipes, found inside the catacombs. Concepts are the work of David Mezcua, who has reflected The Crow's Eye style perfectly in his illustrations. 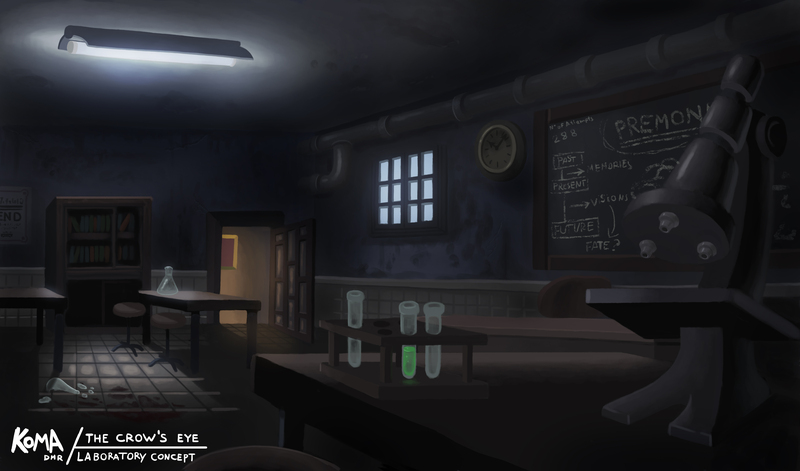 Concept of the inside of one of the classes within the university. Crowswood University façade. 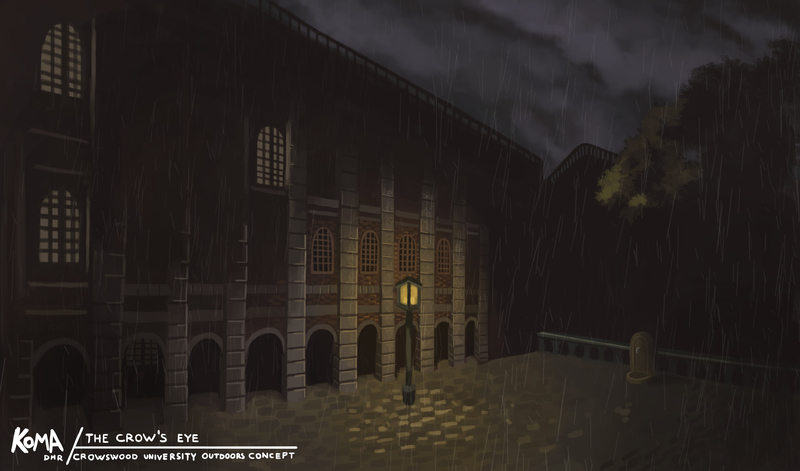 One of the game levels will take place outside the university. The music has been composed by two musicians. The first one is Marcos Saucedo, who lend us a hand at the beginning of the project and composed 6 of the records which enliven The Crow's Eye. The second one is Manuel P. Pérez, current composer who joined our team, and who has created great part of the game's music and sounds. We need the help from the Kickstarter community because during the past two years we have faced high expenses. With the funds raised through Kickstarter we do not intend to become rich, but to be able to dedicate a 100% of our time to our dream, which is creating videogames. We are a group of 6 artists who have taken on modeling, texturizing, animation/rigging, composition, programming and music. We have enough people, but we need game dubbers, both Spanish and English, and since they are from outside the studio it will be difficult that they work with us by mere collaboration. In order for The Crow’s Eye to be finished, we need to pay software licenses, finish game dubbing, and contract external staff to finish advanced animation and programming. In 3D2 Entertainment we bring together young artists with a common idea: creating videogames focused on playability as a main aim, which led us to form an independen videogame studio in Barcelona, back in 2011. We consider ourselves a small family where every opinion counts, and where each contributes with a unique ingredient that makes 3D2 Entertainment be what it is. As of today, we are 6 people involved in this project, even though we count on occasional external help to carry out tasks outside our reach. Many thanks for collaborating, in one way or another, in something as special as this is for us, making our hard work bear its fruit. Every contribution is a great step for us, and with your support and our dedication we hope to finally make The Crow's Eye become a reality. Do not forget that you are also a part of this! Despite having set a date for the game release, it is possible that it is delayed in order to present the game in the best condition. Half of the team does not work in anything other than the project, and maybe in some time, depending on the circumstances, some of the members will be in need of a paid job and combine it with the project. Up to now the project has gone ahead thanks to the help of our families, but this help will not last forever, and it has been 2 years so far. Depending on this campaign's success, a solution could be found to this problem, should it arise. There is a possibility game programming has to be redone for the most part to guarantee that the game works perfectly. We will try to go on with what we already have, but in the event of not being able to do so, we will have to redo it again. We take game quality very seriously, and we are constantly applying small changes and testing the game in order to make it a really good one, so in case it is necessary to postpone the release date to achieve a high quality level, there is no doubt we will do that. Nevertheless, we are realistic and we will not postpone game release without a good reason. We want to keep things as transparent as possible and that you know at all times how the project is coming along, that is why we will keep you constantly informed through social networks, blog, or even the very Kickstarter page, in order to get good feedback. We thank your contribution to the game and you will receive an e-mail with a picture with a special thanks from the team. Your contribution will make you appear on our game's credits + Reward #1. A digital copy of The Crow's Eye game (in case the game is released on Steam you will receive a key) + Rewards #2. A digital copy of The Crow's Eye game (in case the game is released on Steam you will receive a key) + "Making-of" Artbook + Rewards #2. Digital soundtrack + Reward #5. Digital copy of The Crow's Eye on Beta phase, to be updated when the game is released + Reward #6. Four digital copies for the price of two (Reward #5) + Reward #2. Four digital copies for the price of three (Reward #5) + Reward #2. A case with a beautiful cover and two discs insde, including the game and the soundtrack (physical) + Reward #7. A DIN-A3-size poster with a spectacular design + Reward #10. A size-fit T-shirt in two colors and two designs to choose from, to pick the one you like the most + Rewards #11. A "Making-of" artbook with concepts, dismissed things, enemies, etc + Rewards #12. A framed photo of you will appear in the game in some of the decorative documents (Once the game is funded, we will send you an e-mail so that you send us the photo you want to appear in the game) + Reward #7. Your name and surname will appear next to a picture you have sent us to use it in one of the game documents and be immortalized in our game forever. The picture should be serious and have no modern accessories (Once the game is funded, we will send you an e-mail so you tell us your name and surname altogether with the photo you want to see in the game) + Reward #7. Your name will appear in some places of the game such as walls, graves, etc. (Once the game is funded, we will send you an e-mail so that you specify your name and surname) + Reward #13. A framed photo of you will appear in the game in some of the decorative documents (Once the game is funded, we will send you an e-mail so that you send us the photo you want to appear in the game) + Reward #13. Your name and surname will appear next to a picture you have sent us to use it in one of the game documents and be immortalized in our game forever. The picture should be serious and have no modern accessories (Once the game is funded, we will send you an e-mail so you tell us your name and surname altogether with the photo you want to see in the game) + Reward #13. Our musician will compose an exclusive record of 1-2 minutes for you. This record will be included in the game and in the soundtrack + All previous rewards. Your company's logo will appear at the beginning of the game + All previous rewards.